The National Archives and Records Administration includes a large quantity of records related to the military service of many people. In some cases this can be a very valuable resource when conducting family history research. The military service records can help you determine exactly when one of your ancestors served and with what units. This, along with the records of that specific unit can help provide a glimpse of that period of your ancestor's life - which can also result in a tie-in to historic events of that time period. But the most useful records for genealogy research are usually Pension and Bounty Land applications which often include family information that you may not be able to find elsewhere. During the time of some of the earlier wars in our nations history the U.S. government had very little money to pay the soldiers who fought in these wars. So, at the time, they often were not paid at all. Later, the government tried to rectify this by providing pensions for the veterans or their dependents. Often these pensions did not become available until long after the war - and proving that a person had served was not always easy. There were also restrictions regarding proof of disabilities - including the assurance that any disability resulted from military service and not from some other cause. For widows, a pension was terminated if the widow remarried or it could be terminated for a variety of other reasons. To meet these requirements the veteran or dependent often had to provide affidavits from people who had served with him or who were familiar with his life after his period of service. Veterans sometimes had to list their children, the places where they had lived, and any previous or subsequent marriages. While this was a real hassle for the applicants, it resulted in them recording information that can be very interesting and valuable to a family researcher. While the U.S. government was often cash poor, it was land rich as the nation expanded westward. So, in lieu of pay or a pension, veterans of some wars were able to apply for "Bounty Land". After the Revolutionary War, large land grants - up to 10,000 acres were provided to officers. Smaller land grants and disability pensions were later made available to other RW veterans. Grants of 80 to 160 acres were allotted to veterans of the War of 1812, the Black Hawk War, and other "Indian Wars" - but these weren't made available until 1850 - long after the wars. As with pensions, some type of proof of service was required - often consisting of affidavits by other people who had served with the veteran and had known him ever since the time of the service. Again, a potential windfall for a family history researcher if you can find these records for one or more of your ancestors. Revolutionary War: Because of the scarcity of official records in Virginia prior to the Civil War when many records were lost, it has been very difficult to trace some of my colonial ancestors. While it appears likely that my Farris line traces back through Richard Ferris of Henrico County, Virginia - who came from England around 1630, most of the records for the first several generations in Virginia are minimal. However, I can clearly trace the family back to Hanover County, Virginia during the Revolutionary War through a pension application by a John Farris, who was a brother of my gr.gr.gr.grandfather William Farris. These two families migrated westward together through Kentucky and Illinois over a period of more than 40 years until they ended up in Franklin County, Illinois. From there, in 1834 at age 77, John Farris applied for a Revolutionary War pension for service from 1779-1782. His pension application was denied for lack of proof of service, but the application itself, in addition to identifying where the family lived, provides a first hand account of his service - including service at Yorktown, Virginia when Cornwallis surrendered on October 19, 1781 - and helping march the British prisoners to Winchester barracks after the surrender. War of 1812: A bounty land application by a John Farris for War of 1812 service while a resident of Green County, Kentucky in 1813 proved that he was the same person who was living in Fulton County, Illinois at the time of the application in 1850 - and a brother of my gr.gr.grandfather. This provided the missing link between the records for their family in Kentucky and the records in Franklin and Fulton Counties, Illinois. Black Hawk War: My gr.gr.grandfather, Jeremiah Farris, and two of his brothers served in the Black Hawk War in 1832 - and one brother, Joseph B. Farris was killed at the Battle on Sycamore Creek in Ogle County, Illinois. Jeremiah applied for bounty land grants in 1850 and 1855 based on his service - and was granted land warrants for a total of 160 acres. His applications documented his age - which can't be read completely from his tombstone in Kansas, and which is inconsistent in census records. It also includes the only existing documentation of the death of my gr.gr.grandmother, Rosannah (Estes) Farris in December, 1846, in Fulton County, Illinois. Civil War: Three of my gr.grandfathers served in the Civil War - and all later applied for Civil War pensions. In each case, I found unique information in their pension applications that I had not found elsewhere. One of them, Robert Creighton, served in the 112th Illinois Regiment which saw considerable service in East Tennessee. After the short battle at Campbell Station on November 16, 1863, his unit was re-deploying into Knoxville when his horse fell on him and pinned his leg against a log. This injury to his leg never completely healed and was the basis for his pension application. The application was supported by statements from several of his comrades who were present at the time of the incident. 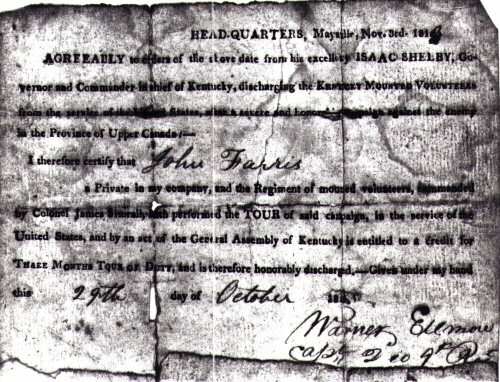 Above is the official discharge notice for John Farris (brother of my gr.gr.grandfather Jeremiah Farris) who served in the War of 1812. When Congress passed a law in 1850 making bounty land grants available to veterans of the War of 1812, the Black Hawk War, and other Indian Wars, John Farris, then a resident of Fulton County, Illinois, applied for an 80 acre grant. His first application was rejected because he couldn't provide proof of service. He stated that his discharge had been left at his father's home in Green County, Kentucky long ago and was now lost. However, a few months later he re-applied - and included the original copy of his discharge which he had located somewhere. The original is now in his military file in the National Archives. It documents his service with Colonel James Simerall's Kentucky Mounted Volunteers on a "campaign against the enemy in The Province of Upper Canada" (Ontario). However, as with most genealogical research, you have to first know some information regarding the individual and when and where he served to know what records to order.